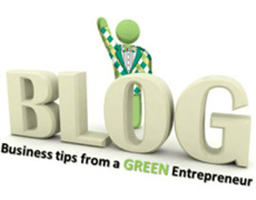 Arms Reach - Green Business Blog | Envirobond Products Corp.
Water always takes the path of least resistance. Many people, by nature, follow this same principle. We tend to look to those within arms reach first when we need help with something. I’ve noticed this to be incredibly evident throughout my growth as an entrepreneur. Business owners often hire people and services, based on the small world that lies directly around them. Whether it’s hiring your friend’s cousin or hiring the contractor that you met at the hockey game last week….it’s choosing the path that requires the least amount of effort. I’ve learned to call this my Arms Reach philosophy. It has forced me to look past my initial direct reach. Hiring the best person from the best pool of people (friend’s cousin included) is always going to provide better results. I’m currently sitting at a tradeshow in the booth that our company created. 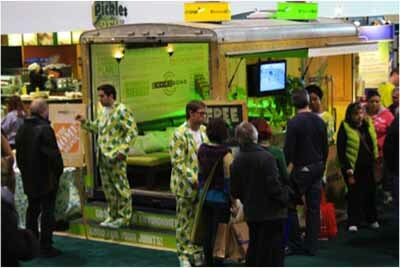 It’s a trailer that has been converted into a Trade Show booth. There’s a coffee lounge atmosphere inside (couch and funky jazz playing on the soundbar speaker) with our product displayed outside. Our team members are energetic, knowledgeable and dressed in bright green, so this catches the attention of people that go by. If you LIKE our company on Facebook, we’ll serve you a fresh organic coffee while we tell you more about our products. Our team members are hand-selected for their ability to work at a trade show. We have an interview and training process targeted at recently graduated marketing students. We can do this at a Home Show because the questions are rarely technical. This way, training can be done in a short period of time. This show is a 10 day gruelling Home Show in Toronto, recently named the 4th largest city in North America. It attracts 150,000 visitors. For us, it’s been an awesome show! Our biggest stress today is that we’re in danger of running out of our 4000 brochures. We forecasted 2000 for the entire show! This is especially good for us, as each brochure comes with a consistent pitch about the Envirobond product line. I’ve spent the last 9 days observing the people that walk by. We also study the other booths in the show and, as a result, noticed many things. The way the average consumer reacts to how companies brand themselves (knowingly or unknowingly). I compare the way that I used to do things, to the way other companies run currently. I’ve learned so much over the last 10 years, that I often laugh at how we used to do things. The crazy thing is that now I can see my old habits very clearly in the other companies around me. If you don’t continue to evolve, you are definitely in the latter category. After studying the show, I can see that the vast majority of the companies, staff their booths with arm’s reach people. These people don’t have the necessary skills in the arts of sales or marketing. Back in the early days, I was occasionally frustrated with my laboratory manager because he couldn’t get the sales pitch right. Shows are busy places and people don’t have a lot of time to stop and chat at every booth. The 55-year-old Bookkeeper who doesn’t want to be there is a polar opposite to the happy, attractive fun person that would love to tell you about the product. The chances that the Bookkeeper is going to have the ability (or passion) to attract and engage Jane and John Smith homeowner is very small in comparison. Also, Sales Reps that have the regular job of managing dealers and contractors (repeat buyers), don’t want to waste their time talking to Jane and John because they really only do one major project a lifetime. However, the Sales Reps are in arm’s reach of management because they’re capable of “doing” the job. The problem is that they look at the Smith’s as small potatoes. They’d most definitely rather be talking to the big contracting company with 20 crews that do 200 projects/year. This plays in their body language and is not ideal to attract the passersby. Not only does it discourage the consumer, but you are also losing an expensive opportunity cost when these reps are not talking to their key customers. Arms reach can be seen in all elements of life, but in business, you can see the direct negative financial effects if you know where to look.